"Yamato-ni" (Japanese-style simmered beef) is a traditional Japanese dish wherein ingredients are cooked slowly with sugar and soy sauce. Mukaku Wagyu, with its rich umami flavor and low fat content, becomes even tastier when simmered or stewed. The rich taste goes very well with rice or sake. Mashed potato is also served in a Japanese style. 1) Cut the loaf of beef into approximately 1 in. (2-3cm)size cubes. Put it in a hot frying pan over high heat and brown the surface. 2) Place (1) into a pot, add sake, water, brown sugar, hatcho-miso and soy sauce, and place over heat with a drop lid. After it starts boiling, add some ginger sliced with the skin intact, reduce heat and cook until the beef becomes tender. 3) Scrape off the skin of a winter melon with the back of the knife and make many cuts in the surface. Cut it into approximately 1 in. sized cubes and boil them with water until they become tender. Soak it in the Happo-ji for over three hours. 4) Microwave potatoes until they become soft, peel off the skin, mash them and mix well with some happo-ji until smooth. 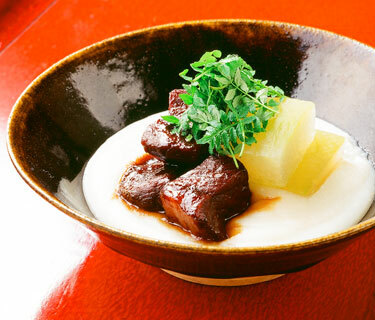 5) Spread the mashed potatoes on a dish, place the beef cooked in (2) on it and garnish with winter melon. Sprinkle some kinome on top. Mukaku Wagyu is raised in Abu-gun and neighboring regions in Yamaguchi Prefecture. It has a great deal of lean meat with a taste inherent to Wagyu, as well as a chewy, meaty flavor. It is a fairly rare type of beef, with only three or four units of livestock shipped per month. Its high-quality meat makes it as one of the representative products of the prefecture. Drop lid is a technique wherein a lid one size smaller than the pot is placed directly on top of the food inside to allow the sauce to cover the food to the top while being cooked.